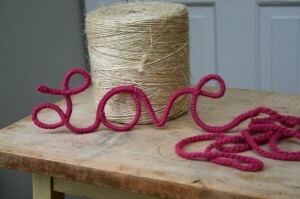 Family Chic posted this simple step by step tutorial on how to make this simple Valentine’s Day craft. All you need is some wire (even a clothes hanger would work), yarn and wire clippers! I am thinking you can make any word you want but I LOVE what she did here! The extra yarn at the end is a cute extra touch. I love it…think I’ll do this for my kids in Sunday School class.